NO PURCHASE NECESSARY TO ENTER OR WIN. A PURCHASE WILL NOT INCREASE YOUR CHANCES OF WINNING. INTERNET ACCESS REQUIRED. STANDARD DATA CHARGES MAY APPLY. Make a Splash with Whole Grains Sweepstakes (the “Sweepstakes”) starts on April 28, 2016 at 12:00 p.m. Pacific Time (“PT”) and ends on July 7, 2016 at 11:59 p.m. PT (“Sweepstakes Period”). The Sweepstakes will include ten (10) separate sweepstakes and be divided into ten (10) weekly entry periods, as outlined in the chart below (each, a “Weekly Entry Period”). ELIGIBILITY: Sweepstakes is open to legal residents of the fifty (50) United States and the District of Columbia who are 18 years of age or older (or the age of majority in their state of legal residence whichever is older) as of date of entry. Employees of Bimbo Bakeries USA, Inc. (“Sponsor”), Walt Disney Studios Motion Pictures, their respective parent companies, subsidiaries, distributors, affiliates, promotion and advertising agencies, and members of their immediate family (spouse and parent, children and siblings and their respective spouses, regardless of where they reside) and persons living in the same household, whether or not related, of such employees, are not eligible to enter or win. If you have received a prize from Sponsor within the past six (6) months in connection with another Sponsor promotion and such prize exceeded $1,000 in value, you are not eligible to participate in this Sweepstakes or receive a prize. Void where prohibited by law. Sweepstakes is subject to all applicable federal, state and local laws. This Sweepstakes is in no way sponsored, endorsed or administered by, or associated with, Facebook. You understand that you are providing your information to Sponsor and not to Facebook. This Sweepstakes is in no way sponsored, endorsed or administered by Walt Disney Studios Motion Pictures. HOW TO ENTER: During the Sweepstakes Period, log into your Facebook account (or, if you do not have one, set up a Facebook account for free at www.facebook.com), visit www.facebook.com/NaturesHarvestBreads and click the Sweepstakes tab. Then, follow the instructions to complete and submit the registration form provided inclusive of your complete name, mailing address, phone number, and e-mail address to receive one (1) entry for the applicable Weekly Entry Period (the “Entry”). Entries must be received by the date and time specified in the chart above to be eligible for the applicable Weekly Entry Period. Entries generated by script, macro or other automated means and Entries by any means which subvert the entry process are void. Limit one (1) Entry per person per day for the duration of the Sweepstakes Period. You may only use one (1) Facebook account to enter the Sweepstakes. Multiple Entries received from any person (“Entrant”), Facebook account or e-mail address in excess of the limitation stated above will be void. All Entries become the sole property of the Sponsor and will not be returned. Entry into one (1) sweepstakes Weekly Entry Period does not constitute entry into all ten (10) sweepstakes Weekly Entry Periods. RANDOM DRAWINGS: One (1) potential winner will be selected by Sponsor in a random drawing for each Weekly Entry Period on or about the dates specified in the chart above (for a total of ten (10) potential Weekly winners) from all eligible Entries received for each applicable Weekly Entry Period. Odds of winning a weekly prize depend on the number of eligible Entries received for each applicable Weekly Entry Period. Non-winning Entries from one drawing will not carry over into subsequent Weekly Period drawings. WINNER NOTIFICATION: Sponsor’s decisions are final and binding on all matters relating to this Sweepstakes. Potential winners for each Weekly Entry Period will be notified by mail, phone, and/or e-mail on or about the dates specified in the chart above and the Weekly Entry Period 3 potential winner will, and all other potential winners may be required to verify eligibility by executing and returning an affidavit of eligibility, a liability release, W-9 form and, where lawful, a publicity release within three (3) days of date of issuance. If such documents are not returned within the specified time period, a prize or prize notification is returned as undeliverable, Sponsor is unable to contact a potential winner or a potential winner is not in compliance with these Official Rules, prize will be forfeited and, at Sponsor’s discretion, an alternate winner may be selected for the prize in question. WEEK 3 PRIZE CONDITIONS: The trip (“Trip”) for winner and up to three (3) guests to Los Angeles, CA scheduled to take place in June, 2016 consists of (i) roundtrip, coach class air transportation from a major U.S. gateway airport nearest winner’s residence to an airport selected by Sponsor in the Los Angeles, CA area, (ii) 4 days and 3 nights standard hotel accommodations (one room, quad-occupancy) selected by Sponsor, (iii) up to four (4) tickets for the opportunity to attend the Finding Dory movie premiere (“Event”) and (iv) round-trip ground transportation to/from the hotel as selected by Sponsor. Exact dates of travel to be determined by Sponsor, in their sole discretion. If winner resides within a 100-mile radius of destination, ground transportation will be provided in lieu thereof. Actual value may vary based on point of departure. Any difference between stated value and actual value will not be awarded. An IRS form 1099 will be issued in the name of the winner for the actual value of the prize received. Trip must be taken on dates specified by Sponsor or prize will be forfeited and Sponsor will have no further obligation to such winner. Sponsor reserves the right to change dates. Winner and guest(s) must travel together on the same itinerary. Guest(s) must be of legal age of majority in his/her jurisdiction or residence (and at least 18 or the age of majority in their state of legal residence whichever is older), unless a child or legal ward of winner and must sign a liability/publicity release prior to issuance of travel documents. If a guest is a child or legal ward of winner, winner must sign and return release on behalf of such child or legal ward. Travel must be made through Sponsor’s agent, on a carrier of Sponsor’s choice. In the event winner elects to travel with fewer than three (3) guests no compensation or substitution will be provided in lieu thereof. Certain travel restrictions may apply. All federal, state and local taxes and all other costs associated with prize acceptance and use not specified herein as being provided, including, but not limited to, additional ground transportation, meals, souvenirs, gratuities, in-room charges (e.g., mini-bar, movies), telephone calls, upgrades, personal incidentals, amenities and luggage fees are the sole responsibility of the winner. Tickets to the movie premiere are subject to certain terms and conditions as specified thereon. Seat locations will be determined by Sponsor. Winner and guest(s) must comply with all venue rules and regulations. Failure to do so may result in winner and/or guest(s) removal from the Event and/or forfeiture of prize. In the event Sponsor is unable to provide tickets to the movie premiere, no compensation or substitution will be provided in lieu thereof; however remainder of prize package will be awarded and Sponsor will have no further obligation to winner. Winner and guest(s) must each have all necessary identification and/or documents required for travelling or other documents as required by Sponsor. The Trip is subject to additional airline and hotel terms, conditions and policies. There is no guarantee that prize winner and guest(s) will meet the cast or filmmakers or any celebrities during the Event. Sponsor reserves the right to substitute the Trip prize (or any element thereof) for one of equal or greater value for any reason. *FANDANGO PROMO CODE TERMS & CONDITIONS: Winners will be solely responsible for any/all transportation to and from movie theater, parking fees, expenses, food, beverages and gratuities. Each winner of Fandango movie tickets will receive a set of four or ten Fandango Promo Codes, as applicable, via e-mail. Each Fandango Promo Code is valid for a movie ticket (up to $13 total ticket and convenience fee value) to see Finding Dory. Fandango Promo Code must be redeemed by 7/31/16 and is void if not redeemed by the expiration date. Only valid for purchases made at www.fandango.com or via the Fandango app for Fandango partner theaters in the U.S. and cannot be redeemed directly at any Fandango partner theater box office. If lost, cannot be replaced. No reproductions will be accepted. No cash value. Not valid with any other offer. Offer valid in U.S. and valid for one-time use only. Not for resale; void if sold or exchanged. If movie ticket with Fandango’s convenience fee included is more than maximum value of the Fandango Promo Code, then user must pay the difference. Any price difference between movie ticket purchased and maximum value of the Fandango Promo Code will not be refunded. Winner and guest(s) must comply with all theater rules and regulations. Failure to do so may result in forfeiture of prize. Fandango Loyalty Solutions, LLC and its parents, affiliates, and subsidiaries are not a sponsor or co-sponsor of this Sweepstakes and are not responsible for the promotion, administration or execution of this Sweepstakes. The redemption of Fandango Promo Code is subject to Fandango’s terms and conditions at www.fandango.com/termsofuse.aspx and www.fandango.com/PurchasePolicy.aspx. ©2016 Fandango Loyalty Solutions, LLC. All Rights Reserved. All prize details are at Sponsor’s sole discretion. PRIZE CONDITIONS: All federal, state and local taxes and all other costs associated with prize acceptance and use not specified herein as being provided are the sole responsibility of the winners. Exact make, model and size of Disney Prize Pack items to be determined by Walt Disney Studios Motion Pictures in its sole discretion. Prizes are awarded “as is” with no warranty or guarantee, either express or implied by Sponsor (including, without limitation, any implied warranty of merchantability or fitness for a particular purpose). Sponsor bears no responsibility if any prize element becomes unavailable. Winners may not substitute, assign or transfer prize or redeem prize (or any portion thereof) for cash (including any part of a prize rejected by winner, if any), but Sponsor reserves the right, at its sole discretion, to substitute prize (or portion thereof) with one of comparable or greater value. All prize details are in Sponsor’s sole discretion. Total ARV of all prizes: $8,980. Limit one (1) prize per person, per household and per Facebook account, per IP address for the duration of the Sweepstakes Period. Prizes will be awarded provided a sufficient number of eligible Entries are received. Prizes will be awarded if validly claimed by [date], after which no alternate prize winners will be selected, nor unclaimed prize awarded. 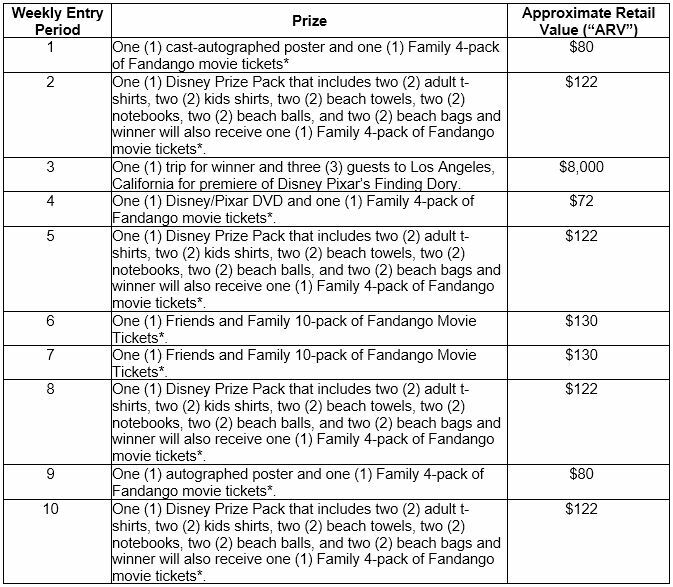 GENERAL CONDITIONS: By participating, each Entrant and each guest/travel companion of winner agrees: (a) to abide by these Official Rules and decisions of Sponsor, which shall be final and binding in all respects relating to this Sweepstakes; (b) to release, discharge and hold harmless Sponsor, Walt Disney Studios Motion Pictures , Fandango, Facebook, and their respective parents, affiliates, subsidiaries, distributors, and advertising and promotion agencies, and the respective officers, directors, shareholders, employees, agents and representatives of the foregoing (collectively, “Released Parties”) from any and all injuries, accidents, liability, losses and damages of any kind to persons, including death, or property resulting, in whole or in part, directly or indirectly, from Entrant’s participation in the Sweepstakes or any Sweepstakes-related activity or the acceptance, possession, use or misuse of the prizes (including any travel/activity related thereto); and (c) to the use of his/her name, voice, performance, photograph, caption, entry, and/or likeness for programming, advertising, publicity and promotional purposes in any and all media, now or hereafter known, worldwide and on the Internet, and in perpetuity by Sponsor and its designees, without compensation (unless prohibited by law) or additional consents from Entrant or any third party and without prior notice, approval or inspection, and to execute specific consent to such use. By participating, Entrant also agrees not to release any publicity or other materials on their own or through someone else regarding their participation in the Sweepstakes without the prior consent of the Sponsor, which it may withhold in its sole discretion. MISCELLANEOUS: Released Parties are not responsible for lost, late, incomplete, damaged, inaccurate, stolen, delayed, misdirected, undelivered, or garbled Entries, or for lost, interrupted or unavailable network, server, Internet Service Provider (ISP), website, or other connections, availability or accessibility or miscommunications or failed computer, satellite, telephone or cable transmissions, lines, or technical failure or jumbled, scrambled, delayed, or misdirected transmissions or computer hardware or software malfunctions, failures or difficulties, or other errors or difficulties of any kind whether human, mechanical, electronic, computer, network, typographical, printing or otherwise relating to or in connection with the Sweepstakes, including, without limitation, errors or difficulties which may occur in connection with the administration of the Sweepstakes, the processing of Entries, the announcement of the prizes, or in any Sweepstakes-related materials. Released Parties are also not responsible for any incorrect or inaccurate information, whether caused by site users, tampering, hacking, or by any equipment or programming associated with or utilized in the Sweepstakes. Released Parties are not responsible for injury or damage to any person's computer related to or resulting from participating in this Sweepstakes or downloading materials from or use of the website. Persons who tamper with or abuse any aspect of the Sweepstakes or website, gain unauthorized access to accounts, who act in an unsportsmanlike or disruptive manner or who are in violation of these Official Rules, as solely determined by Sponsor, will be disqualified and all associated entries will be void. Should any portion of the Sweepstakes be, in Sponsor’s sole opinion, compromised for any reason, including virus, worms, bugs, non-authorized human intervention or other causes which, in the sole opinion of the Sponsor, corrupt or impair the administration, security, fairness or proper play, or submission of Entries, Sponsor reserves the right at its sole discretion to suspend, modify or terminate the Sweepstakes (or portion thereof) and, if terminated, at its discretion, select the potential winner(s) for the drawing(s) at issue from among all non-suspect, eligible entries received for the applicable drawing(s) prior to action taken. If due to a printing, production or other error, more prizes are claimed than are intended to be awarded for any prize level per the above, the intended prizes will be awarded in a random drawing from among all verified and validated prize claims received for that prize level. In no event will more than the stated number of prizes be awarded. CAUTION: ANY ATTEMPT TO DELIBERATELY DAMAGE THE WEBSITE OR UNDERMINE THE LEGITIMATE OPERATION OF THE SWEEPSTAKES MAY BE IN VIOLATION OF CRIMINAL AND CIVIL LAWS AND SHOULD SUCH AN ATTEMPT BE MADE, SPONSOR RESERVES THE RIGHT TO SEEK ANY AND ALL REMEDIES AVAILABLE FROM ANY SUCH INDIVIDUAL TO THE FULLEST EXTENT OF THE LAW, INCLUDING CRIMINAL PROSECUTION. ARBITRATION: Except where prohibited by law and as provided below in the Choice of Law section, as a condition of participating in this Sweepstakes, participant agrees that (1) any and all disputes and causes of action arising out of or connected with this Sweepstakes, or any prizes awarded, shall be resolved individually, without resort to any form of class action, and exclusively by final and binding arbitration under the rules of the American Arbitration Association and held at the AAA regional office nearest the participant; (2) the Federal Arbitration Act shall govern the interpretation, enforcement and all proceedings at such arbitration; and (3) judgment upon such arbitration award may be entered in any court having jurisdiction. Under no circumstances will participant be permitted to obtain awards for, and participant hereby waives all rights to claim, punitive, incidental or consequential damages, or any other damages, including attorneys' fees, other than participant's actual out-of-pocket expenses (i.e., costs associated with participating in this Sweepstakes), and participant further waives all rights to have damages multiplied or increased. CHOICE OF LAW: All issues and questions concerning the construction, validity, interpretation and enforceability of these Official Rules, or the rights and obligations of participant and Sponsor in connection with the Sweepstakes, shall be governed by, and construed in accordance with, the substantive laws of the Commonwealth of Pennsylvania, USA; provided that all issues and questions regarding Walt Disney Studios Motion Pictures intellectual property and prizes provided by Walt Disney Studios Motion Pictures will be governed and construed in accordance with the laws of the state of California and in the event of any dispute, all Entrants irrevocably consent to the jurisdiction of the state and federal courts located in Los Angeles, California to resolve such disputes. REQUEST FOR WINNER’S NAMES: For the names of the winners (available after July 21, 2016) send a self-addressed, stamped, envelope by August 20, 2016, to: Make a Splash with Whole Grains Sweepstakes Winners, 5000 Birch Street, Suite 1000, Newport Beach, CA 92660.